A sunny spring morning means muddy puppies tussling gleefully around the kitchen table—on duty, sort of, keeping the free-range goats and chickens out of the kitchen and off the table and counters. The outdoor kitchen takes some getting used to, especially on cold, rainy, winter nights, but in nice weather it’s one of the great joys in our little village. Guests love it. Hardly a positive review goes by that doesn’t mention the puppy-dog-goat-and-chicken-show and their mealtime entertainment. The puppies yap loudly in play and a twinge of frustration arises—nervously I hope they are not waking those sleeping roadtrippers in the A-frame cabin, that nice couple from Virginia who’re here renting some of our peace and quiet for a few days. The rising buzz of the generator or power tools feeds, too, a niggling conflict—we’re building a greenhouse so we can grow more of our own food, year-round, but what about the quiet retreat our guests are paying for? And what about the real vision: a sustainable village with space for more cabins and families who want to live this idealistic lifestyle, complete with work, noise, and long-term commitment? Our remote village/intentional community in northern California, nestled on a large private parcel way out in the National Forest, was originally built around the ideas of sustainability and community. We’re totally off-grid: composting toilets, gravity-fed spring water, woodstoves fueled from the dense forest around us, and a few acres of land cleared for extensive kitchen gardens and a bit of solar power. The three smaller cabins and the massive-feeling Community Center were—and still are—intended to house those intrepid souls ready to make this land their home and this their life. Over the nearly six years since the first of the land was cleared, there have been at least several dozen of these intrepid idealists, including several families, who have lived and worked on the land for anywhere from a few days to a few years. Five years’ worth of WWOOFers, commune-hoppers, past and future zen monks, and prospective community members of all stripes have helped build this place into what it is now, and for the last year or so, hundreds of short-term renters have flooded in to enjoy the fruits of their labor. Last April, less than a year ago, a small nomadic family contacted us and let us know they were ready to move in and commit to residency—our village was everything they dreamed of and they couldn’t wait to live the sustainable life, they said. Within days, they were happily housed in the Community Center and getting dirty in the gardens, learning what young broccoli plants look like and how to manage a composting toilet system. Since they had no money and no income, we took the two parents, small child, and tiny dog on as WWOOFers. We offered two months of this arrangement, time for them to figure things out and establish their own income stream, whether from work in town, online, or otherwise. 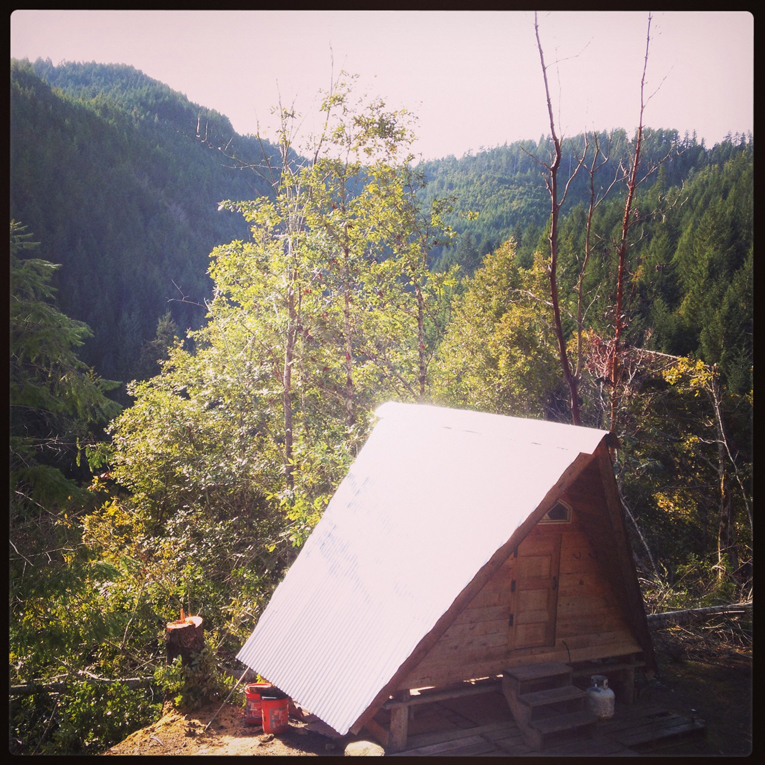 Around the same time, on a lark, we had posted one of our cabins on a popular online vacation-rental sight—never imagining the booming popularity we would find for our remote, off-grid accommodations. The family eventually moved on, and for this April, we’ve been contacted by an art-rock band from Canada who wants to rent the Community Center for two months to record an album—paying us $7000. With that kind of competition, we no longer feel so free to offer up the Community Center to those idealistic “potential community members” who may or may not end up working out long-term and who, short-term, have “only” their energy and enthusiasm to contribute. How sad that energy, enthusiasm, and idealism lose out to $7000. And yet—running a community on enthusiasm alone is somewhere between impossible and unsustainable. Renters have turned out to be great contributors of energy, enthusiasm, and idealism as well. They may stay for only a night or two, but the great majority seem to be nearly awestruck with what they find out here in the forest. Escaping city-dwellers, many express their dreams of living in tiny cabins in the woods surrounded by goats, chickens, and gardens. They are inspired by what we’re doing and are expressively appreciative of the chance to experience this lifestyle, even if it’s just en route between the city where they live and the city that they’re visiting. With short-term renters taking up most of the available real estate, we are faced with the challenge of growing a more permanent community while so many of our resources are dedicated to the business of rentals. Is this the sell-out end of our idealistic community visions? Or is there a way to balance long-term community with short-term financial enrichment? In my better moments, I see the current process as an evolution of this community, in step with the larger evolution of our socio-economic environment. Just as we mix and blend species and systems in our permaculture designs, so too would an ideal human community integrate all types of participation and roles. Short-term renters can provide an infusion of energy and cash, which is used to support residents who take care of guests’ needs while also caring for the land and the shared village resources. Housing can be delegated appropriately—reserving the high-dollar digs for those who choose to contribute to the community with their high dollars. I spent a blissfully happy season at the Lama Foundation in New Mexico as a “summer steward,” paying towards a community food fund, living in my own tent, and working 20-30 hours per week running the retreat center activities, which in turn funded the whole community. I never felt like an employee, though; I chose my hours and my chores and mostly remember taking part in the bountiful offerings of the community in the form of beautiful gardens and hiking trails, classes, meals, events, drum circles, meditations, music, visiting teachers, and a rich network of “Lama Beans” from current residents to visitors to founding members. Lama maintains a vastly complicated “blended ecosystem” of community members—from summer stewards who contribute a modest amount of cash and labor, to residents who work long hours and are paid a tiny annual stipend, to guests and visitors who pay more for fancier digs and less work. Envisioning that kind of future feels so overwhelmingly big as I sit here in the garden watching the sprinkler wave deliberately back and forth over the first spring seeds. It’s just little ol’ us—three of us living here now, including two permanent residents and one woman on a personal healing journey, who’s set up camp down by the river and mostly keeps to herself other than the one day per week that she trades for rent. On Monday a new WWOOFer arrives—bursting with enthusiasm and rarin’ to spend two weeks experiencing whatever it is he imagines we are doing out here. The weekend is crowded with Spring Break renters; a journalist and a playwright brewed us up a phenomenal ginger-turmeric-vanilla-hemp-milk-latte this morning and are now out exploring with their dog on the forestry roads. Two couples from San Francisco will spend the weekend in the Community Center; their visit pays for the polycarbonate roofing we just installed on the new greenhouse. Last spring was my first experience with growing food. Sure, I had helped weed or harvest a couple gardens in my life, but I honestly could not really believe that planting seeds would actually lead to food coming out of the ground. I tried to plan and record everything I did in the garden, but the organic chaos of life soon took over and, by summer, only God knew what seeds were planted where. We watered and weeded faithfully, and eventually, to my astonishment, food appeared. Some seeds seemed to have disappeared, while others magically transformed into enormous plants full of delicious food. Part of the project here—“living in tune with nature”—means allowing space in our lives for the active, unpredictable participation of sun, rain, ice, animals, birth, death, and unplanned growth and change. As a still-beginner gardener, I don’t really know which seeds will come up, or when, or what they’ll look like. Every intentional community I’ve ever witnessed has been in some state of flux, with active questions about the future: how to support growth, which seedlings to thin, which limbs to prune, how to integrate all the beings that arrive on the proverbial doorstep with their gifts and needs in tow. Especially given the remote location of our village, building financial self-sufficiency through cottage industry and renting would be the best possible situation for current and prospective residents. Our community may not need this business to survive, but it sure fertilizes our soil—sometimes literally. So, today I will plant seeds in the garden and change the sheets in the cabins, not really knowing what plants will come or how our business and community will grow together. But apparently, our merely-human efforts will combine with the somewhat unpredictable forces of sun, rain, fate, chance, etc. to produce some bountiful yield of unnameable challenge and delight. Jane Moran grows potatoes, herds goats, and hosts visitors on an experimental mountaintop commune-of-sorts in northern California, and co-runs a holistic health center “in town” in her spare time. ← Birth Announcement: We’ve Got a Brand New Website! Very interested in a short stay next month, if available. I would like to introduce my wife to sustainable organic lifestyle practices please reply. I think a lot of people may need to “check out” of their everyday lives for many reasons and be ready to pay cash for it. With suitable legal disclaimers and vivid descriptions about what to expect it could work. I personally would find a community lifestyle with common meals, doing chores with others and having reasons to be outside and walking to be a healthy contradiction to the isolation and persistent inactivity of my lifestyle. Hotels in our area start at about $85 a night and offer none of these benefits. Being able to register with a community and spend a weekend now and then would be valuable to me.